#36 Wouter Peeters makes a sprawling save - Wouter Peeters dives to stop a second chance goal in the second period 11/22/17. Well, you know we couldn't just skate into the Thanksgiving holiday without a little drama. With a player being put on the IR and a new acquisition being announced, it seemed like the big story of the week being behind us. As soon as the players took the ice for warmups it became apparent that this wasn't the case. 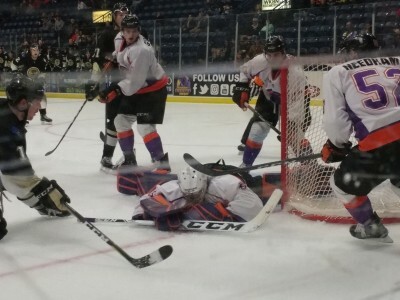 Goaltender Ivan Prosvetov did not take the ice, instead Wouter Peeters took the net with an emergency netminder, Hunter Robbins of the Pittsburgh Penguins Elite U16. I had said I thought Peeters needed another starting chance and this was going to be the night apparently. The first period was a lot of hit, shots on goal, and some decent scoring chances but no scoring. The Lumberjacks outshot us 15-9 but I thought the Phantoms had the better chances. The second frame was a lot more eventful. After both teams had an abbreviated powerplay with some 4-on-4 in the middle, the Phantoms would get on the board first. On the first shot of the period for the Phantoms, Alex Barber would send in a wrist shot from well above the left faceoff circle that would find a seam through traffic at 4:42. Curtis Hall would be denied shorthanded by Adam Brizgala a few minutes later, something only worth mentioning since this was his only save of the frame. The next 4 shots from the Phantoms would find the twine behind him. Things would really begin to breakdown for the 'Jacks when Egor Afanasyev lost the puck to Matthew Barry in the low slot. Barry would immediately launch a backhander past Brizgala at 8:08. Peeters would make the save of the night about 2:20 later and in an ensuing scrum behind the net, Jagger Joshua would draw and extra penalty out of Wyatt Bongiovanni. The Phantom would win the faceoff and eventually Mike Regush would send a pass into the slot which may have been intended for a wide open Matthew Thompson on the far post but Eric Esposito happened to be in the slot to one-time it for the goal on shot 3 of the 2nd at 10:50. Blown coverage by Bray Crowder would lead to Curtis Hall being unchallenged in the left faceoff circle for a snap shot to make it 4-0 at 12:18. The 'Jacks would take their timeout but that would not help. Off the following faceoff, the Phantoms would end up on a 2-on-1 with Esposito carrying the puck and Barry flanking him. Marc Del Gaizo was the lone defender and he went down to block the shot but Esposito snapped it over him to make it 5-0 on just the 6th shot of the game. That would end the evening for Brizgala. The Phantoms would get one shot on Keegan Karki in the frame and he managed to make the save. Clayton Philips would get one back for the 'Jacks before the end of the period, taking a Emillio Petersen pass at the point and wristing one through traffic with 1:52 left. The 'Jacks still outshooting the Phantoms 11-7 in the frame but the Phantoms would head into the final frame up by 4 goals. Both teams would trade goals in the third. Marc Del Gaizo would get his first of the season at 6:38, dancing through traffic at the point and sending a shot through a mess of players in front of Peeters and in the Phantoms crease. A little under 2:00, the Phantoms would get a second powerplay goal when Thomson found a little room to skate and wrist a laser from the hashmark of the right faceoff circle, to give him the leagues sole lead in powerplay goals on the season. All 6 of his goals and his lone assist coming on the powerplay. Just 1:18 later, Chase Gresock would backhand a pass from the half-boards into the slot that found Max Ellis streaking in for a shot and a goal. Anthony Del Gaizo would power his way between Jake Gingell and around Julian Kislan and slide one under the pads of Peeters, the only soft goal Peeters would allow on the night but with only 1:01 left in the game, the 4 goal lead would hold. the 'Jacks would outshoot the Phantoms 15-9 in the period and 41-25 overall. Where to begin on this one. I guess the first think to mention is that this was the first win for Peeters and arguably his best performance. The only game he played you could argue he did better was the 3-2 shootout loss where he stopped 32 of 34.He still looked a little awkward, overplayed the puck at times, and generally not the smoothest moving netminder I've seen but he uses his size and position well. The defense did a great job making up for his shortcomings. If he could play this way consistently, Prosvetov might get some breathing room. And speaking of the Russian netminder, he was seen in the hallways on crutches wearing a boot. I was told by sources that it's probably just a sprain and that the x-rays did not show any fractures, the swelling was subsiding quickly and there was no reason to worry. I'm still going to worry a bit. Curtis Hall continues his dominance over the 'Jacks His 1g and 1a gives him points in 5 of 6 games against the jacks, 7g, 4a total. Max Ellis has a 5 game point streak (3g, 5a) and points in 8 of his last 9 (4g, 7a). With the win, the Phantoms make their way to 2nd place in the East. This was only the second win in 60:00 at home, the other one being a 3-1 win over the 'Jacks in November. Next up is back-to-back road games against the Central Illinois Flying Aces. A pair of wins there will keep us at least in 2nd place in the East with the chance of being in first place, at least in total points. The Phantoms have a light week next week with just a single game at home against the NTDP U17s, our first look at the younger squad. Until then, here's a couple highlights. Mr. Powerplay Matt Thompson with the goal. Chase Gresock to Max Ellis for the goal.